Canadian junior defenceman Noah Dobson is proof there are different paths to teenage hockey stardom. Dobson scored Canada's game-winning goal midway through the second period against Switzerland on Thursday when he took a pass from teammate Barrett Hayton and swept a shot through the pads of Swiss netminder Akira Schmid, even though defenceman Janis Moser was draped all over the Canadian. 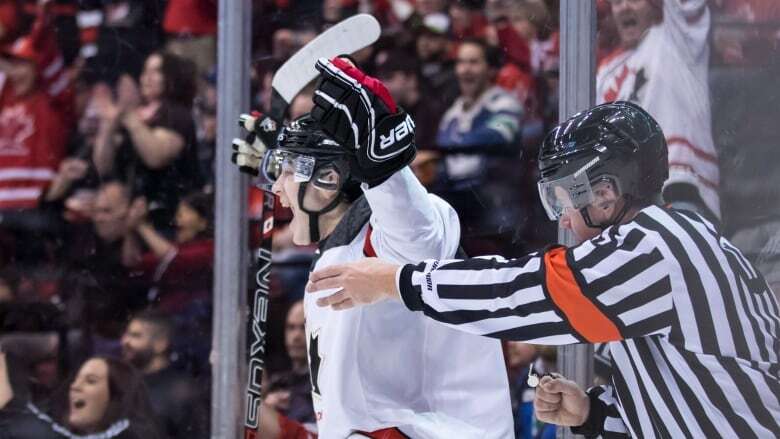 Although this was a difficult 3-2 victory for Canada, Dobson was a bright spot as his team improved to 2-0 in the 10-country, 11-day world junior tournament in Vancouver and Victoria. "When we're doing things right we control play," Dobson said. "We all went around the room knowing what we can do better, cleaning up the defensive zone, but at the end of the day playing back-to-back nights we were able to grind one out and get a big win against a really good team that competed hard. "We're happy with where we're at, but we obviously know we can be better and keep improving as the tournament goes on." How the smooth-skating, two-way defender became a member of the Canadian team is unique to the 18-year-old Dobson. After his bantam season with the Summerside Western Caps, he could have followed the conventional route for elite-level young players. He could have stayed at home on Prince Edward Island and played midget hockey to prepare for either his next step in major junior or at a college in the United States. Instead, he attended Bishop's College School in Sherbrooke, Que., performed for the high school hockey team and also enjoyed a stint with Team PEI at the 2015 Canada Winter Games in Prince George, B.C. It was in Prince George where he was approached by an official with the EC Red Bull Academy in Salzburg, Austria and invited to spend a year at the premier facility, which is run by Pierre Page, a former coach of the Quebec Nordiques and Calgary Flames. Dobson toiled for 2015-16 EC Red Bull's under-18 and under-20 teams. But the game schedule was light. There was more emphasis on practice and skill development, and that suited Dobson just fine. His day included online school classes in the morning and skill development on-ice sessions in the afternoon. Dobson was not the only Canadian over there. His teammates in Austria included fellow Islanders, Jeremy McKenna (Summerside) and Chris McQuaid (Charlottetown), as well as Ethan Lavallee (Skead, Ont.). Dobson enjoyed living in Europe and visiting countries like Finland, Switzerland and Czech Republic for the occasional game. It was quite the experience. He returned home that summer and was invited to the Canadian under-17 camp. 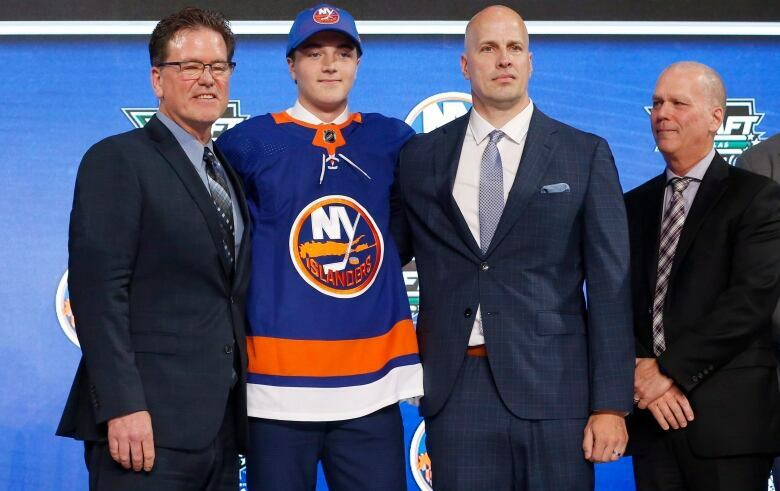 Since his European experience, he won the 2017 Hlinka Cup with the Canadian under-18 team, the Memorial Cup with the Acadie-Bathurst Titan last May and then a few weeks later he was the fifth defenceman taken in the 2018 NHL draft, 12th overall by the New York Islanders. After he was cut by the Islanders at this fall's training camp, Dobson returned to Acadia-Bathurst for his third season and was named team captain. Some scouts believe Dobson was the second best defenceman taken in the draft last June behind Swede Rasmus Dahlin, who was chosen by the Buffalo Sabres first overall. He certainly has proven his worth in the early going in Vancouver. Entering the tournament, Canadian head coach Tim Hunter planned to rely on his 19-year-old defencemen Evan Bouchard, Josh Brook, Ian Mitchell and Markus Phillips. But the way Dobson has performed so far has provided his coach with another option. Coming off its easy-as-pie 14-0 win in the tournament opener against Denmark, Canada struggled on special teams in its one-goal win over Switzerland. The hosts went 0-for-5 on the power play and surrendered two goals while shorthanded. But Hunter's side has a day off before his players meet the Czech Republic on Saturday and then finish the preliminary round against Russia on New Year's Eve. There still is plenty of time to work out the kinks. It will be interesting to see the role Dobson will play for Canada as the tournament progresses.